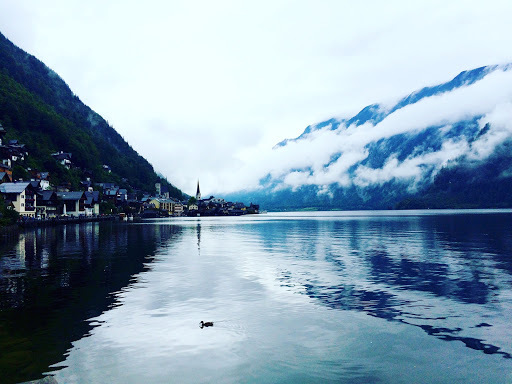 This morning we set off to the destination that I had been looking forward to the most, Hallstatt. This involved getting 2 trains, changing at Attnang Pucheim, but the whole journey was quite easy and lasted about 2 hours. 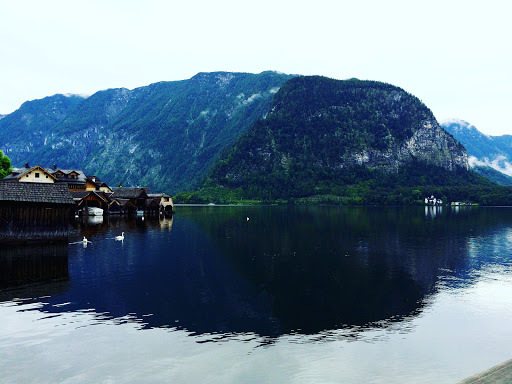 We had arrived at Hallstatt station at 11am and had to get the ferry across the lake, for 2.50 euros. It was whilst we were waiting to board the boat that the heavens decided to open and we were drenched. 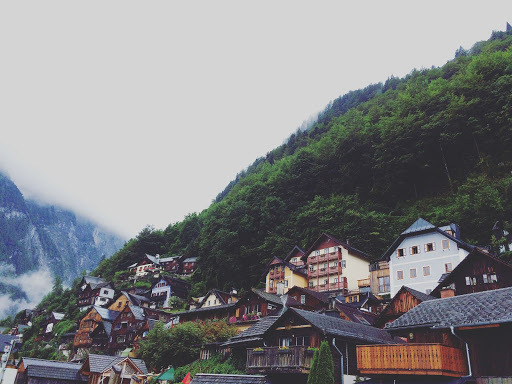 By the time we arrived at the town the rain had laid off. 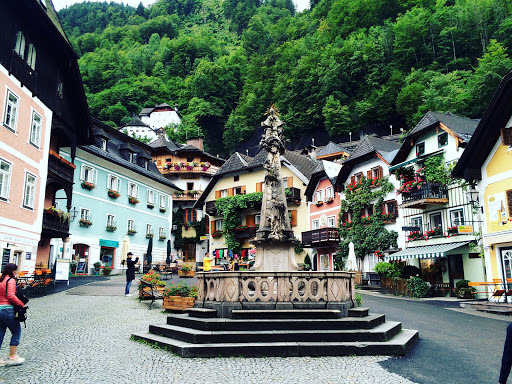 Luckily for us our hotel, Seehotel Gruner Baum, was right in the middle of the market square and unmissable. We dropped off the luggage as it was still to early to check in and started to explore. Our original plan had been to hire a boat and swim in the lake but it was clear the weather was eliminating that as an option. Whilst the rain had cleared the clouds remained. 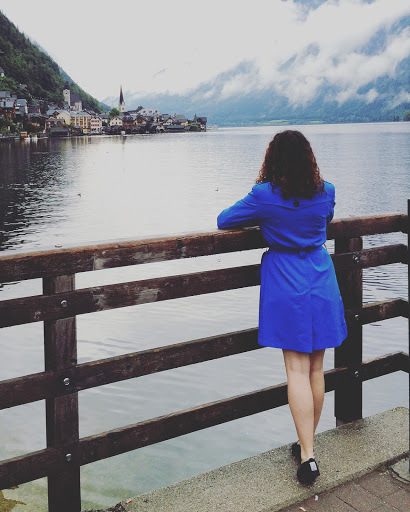 We walked along the lake, gazing at the beautiful views. The clouds were low and it really gave it the most mystical feel. You know when you really love someone and you look at them and just want to squeeeeeeeeze them because you’re just so happy, well thats what the view made me feel. No photo could truly capture how stunning it was. We grabbed some food at the Maislinger Backerei and sat by the lake eating. 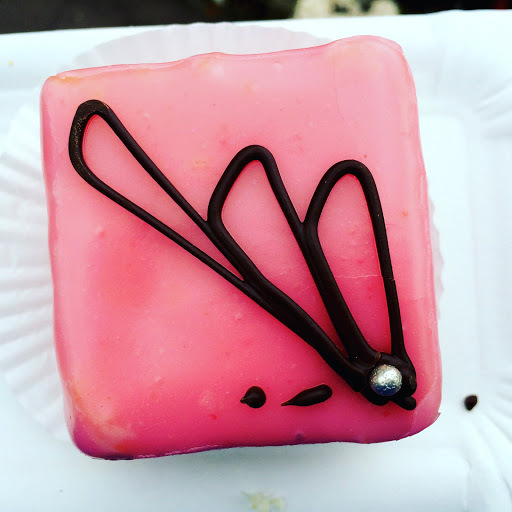 During my time in Austria I developed a deep obsession with the Punschkrapfen cake, which had attracted me with its bright colours and truly captured my heart with its beautiful rum flavour. We visited the church, although I was most excited about the accompanying bonehouse. 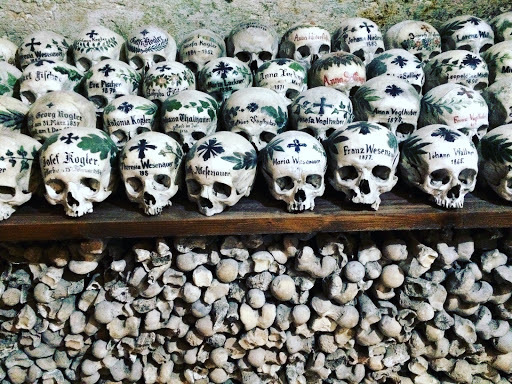 Dating back to the 12th century it contains over 600 beautifully painted skulls, the largest collections of skulls in the world. 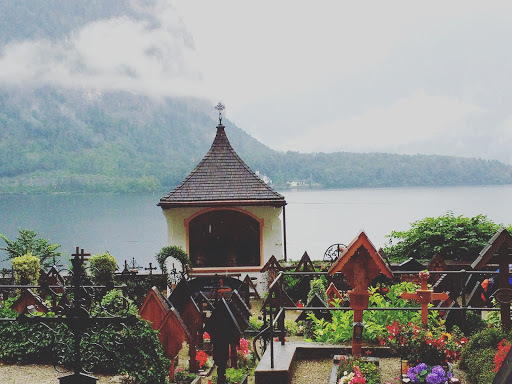 Graves in Hallstatt can be reoccupied after 10 years, meaning the previous occupant can find themselves on display in the Bone house. As cremation is now more popular this is something that is increasingly rarer. 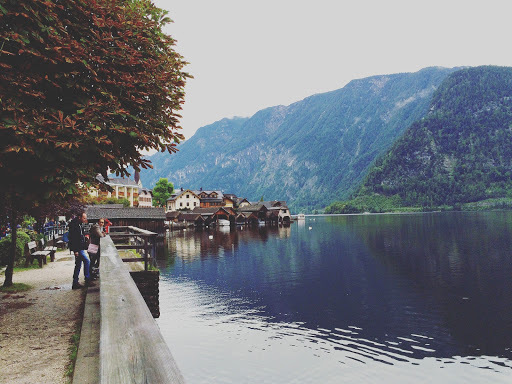 The rain started up again so we decided to go explore the Hallstatt museum. It was 8 euro entry and contained many findings from the salt mines, from burials and roman remains. I have to be honest, I found it quite boring, everything was a bit bland. We then went back to our hotel to check in. Seehotel Gruner Baum is a beautiful 4 star hotel and our room was lovely. It was a fantastic size, with a huge bathtub. 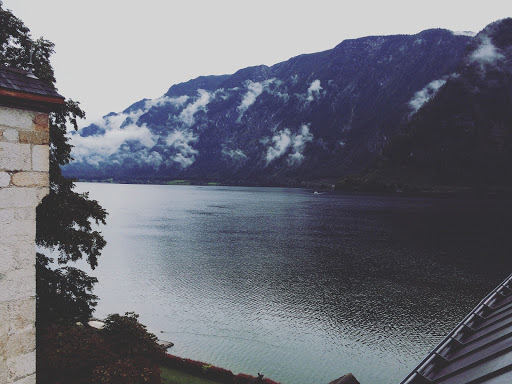 We had wonderful views over the lake and they even left us little pastries in our room. It cost about 160 euros a night to stay there, we always like to treat ourselves to one night in a a fancy hotel when we’re away! 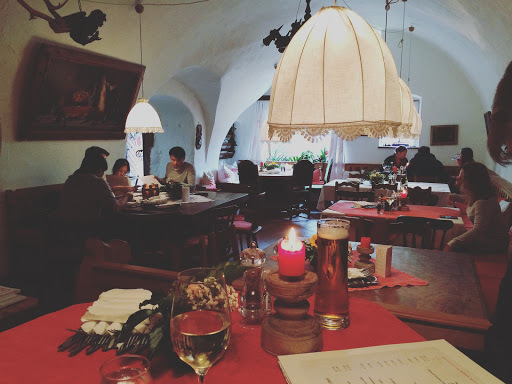 We ended our day with a delicious dinner at Braugasthof Lobisser, which was a wonderful traditional restaurant, situated inside a 15th century local brewery and situated right on the shore of the lake. Adam had one of the biggest schnitzels I had ever seen! A great end to the day.